Decades after the work-life balance became part of the conversation on professional success, are we any closer to finding equilibrium? Has technology tipped the scales? And what does success even mean? The 3rd annual student-run Women in Business Conference took place in Barcelona recently under the theme The Power of Balance: Defining and Owning Your Own Success. The conference brought together business women working in a range of sectors – from automotive and finance, to energy and technology – and in companies of all sizes. They discussed ways to balance work and personal commitments, and how to find and define success. It’s not just about motherhood. “The work-life balance is everyone’s issue,” said Isabel Abellán Serna, head of institutional sales at Banco Sabadell. While much of the discussion inevitably centers around the demands of motherhood, the conversation must encompass all interests outside of work – whether that’s children or charity or a hobby – regardless of gender. Company culture matters. Companies more adverse to work-life balance often have deeply ingrained cultures that prize clocking long hours. Some simple indications that a company is different: employees who generally go home on time, and formal personnel policies that allow for part-time work, work from home, and other flexible arrangements, which technology enables. Another indicator can be the gender mix of employees, though aggregate figures can mislead: It may be true that half of employees are women, but how about management? And are women in the core businesses? Liking your job is key. Competing demands on time become much easier to handle if you truly like what you do and feel that your work has purpose. “You have to stop and think about what you’re doing and what you want,” said Mireia Ribot of Gas Natural Fenosa. “A moment arrives when you ask yourself does what I’m doing have real meaning?” said Isabel Buil, director of reputation for Affinity Petcare and head of its foundation. Resilience is required. Even in the best of circumstances, the work-life balance can be tough to achieve, especially for women with young children. Having a supportive partner is crucial, as is the knowledge that it normally gets easier over time. Speakers stressed the need to cede control of some things at home and at work. “Don’t think that you have to be perfect,” said Marta Ortega, senior relationship manager at Commerzbank. Seize opportunities. Concern over demands on their personal lives may make some people – especially women – hesitant to take on additional responsibilities at work or go into certain sectors such as finance and consulting. 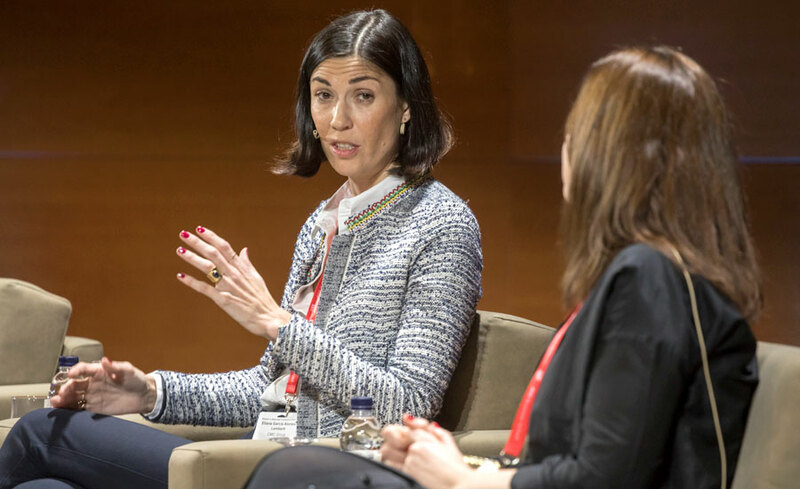 Laura Ros, general director of Volkswagen Spain, encouraged women to seize opportunities, even if they weren’t 100% sure it was the right time or they had the right profile. “Don’t wait for someone to ask you to do something. Raise your hand. Participate,” she said. Education is freedom. Continuous education – throughout your career – gives you greater freedom and flexibility to chart your own course. It’s crucial in all industries, but particularly those such as technology that are constantly changing. “You have to be learning all the time,” said Raquel Tejedor, account executive at Microsoft. Beyond formal courses, education can take lots of forms – from receiving industry newsletters to listening to TED Talks.